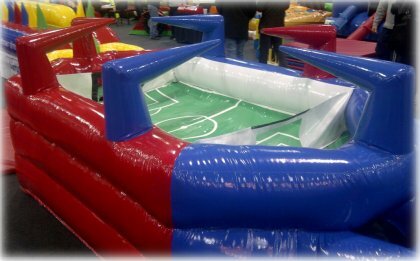 Airstream Football is a giant blow football game that's a perfect amusement for office fundays, youth groups, or indeed any indoor event. Played by up to six participants at a time on a three-a-side basis you use the airstream from the flexible jets to power the ball around the pitch, shoot at your opponents goal, and protect your own. The Airsteam Football requires an overall operating area of 10x10ft, including room for the participants to stand, and requires access to normal electric socket for power. It's available on either a staffed or unstaffed basis. If you have any queries, questions, or would like to hire Airstream Football for your event please call us on the number below or click to enquire and we will do all we can to help.